Gander is a town located in the northeastern part of the island of Newfoundland in the province of Newfoundland and Labrador, approximately 40 kilometres (25 mi) south of Gander Bay, 100 km (62 mi) south of Twillingate and 90 km (56 mi) east of Grand Falls-Windsor. Located on the northeastern shore of Gander Lake, it is the site of Gander International Airport, once an important refuelling stop for transatlantic aircraft, and still a preferred emergency landing point for aircraft facing on-board medical or security issues. Most of the streets in Gander are named after famous aviators, including Alcock and Brown, Amelia Earhart, Charles Lindbergh, Eddie Rickenbacker, Marc Garneau and Chuck Yeager. Gander was chosen for the construction of an airport in 1935 because it is very close to the great circle route between New York and London. In 1936, construction of the base began, and the town started to develop. On January 11, 1938, Captain Douglas Fraser made the first landing at "Newfoundland Airport," now known as Gander International Airport, or "CYQX," in a single-engine biplane, Fox Moth VO-ADE. During the Second World War, as many as 10,000 Canadian, British and American military personnel resided in Gander. The area became a strategic post for the Royal Air Force Air Ferry Command, with approximately 20,000 American- and Canadian-built fighters and bombers stopping at Gander en route to Europe. After the war, the airbase became a civilian airport, and the location of the town was moved a safe distance from the runways. Construction of the present town site began in the 1950s, and the present municipality was incorporated in 1958; the settlement around the airport was eventually abandoned. After the Second World War, the town grew as the airport was used as a refuelling stop for transatlantic flights, earning its name "Cross-roads of the world." Efforts have been made to diversify the economy from being dependent on the airport, particularly as new aircraft designs permitted longer-range flights without the need for landing to refuel. Gander was the site of a major aircraft accident, Arrow Air Flight 1285, on December 12, 1985. 256 people were killed in the disaster, making it the deadliest air crash to happen in Canada. In 2001, Gander International Airport played an integral role in world aviation in the hours immediately following the September 11 attacks when all of North America's airspace was closed by Transport Canada and the United States Federal Aviation Administration (FAA). As part of Operation Yellow Ribbon, 38 civilian and 4 military flights bound for the United States were ordered to land at the airport—more flights than any Canadian airport other than Halifax International. More than 6,600 passengers and airline crew members, equivalent to 66 percent of the local population—third highest number of passengers, behind Vancouver International Airport, which received 8,500, and Halifax—found themselves forced to stay in the Gander area for up to six days until airspace was reopened and flights resumed. Residents of Gander and surrounding communities volunteered to house, feed, and entertain the travellers in what became known as Operation Yellow Ribbon. This was largely because Transport Canada and Nav Canada asked that transatlantic flights avoid diverting to major airports in central Canada, such as Toronto Pearson International Airport and Montréal-Dorval. Lufthansa named one of its Airbus A340 (registration D-AIFC) aircraft Gander/Halifax to thank both cities for their handling of rerouted travellers on September 11. A book, The Day The World Came to Town, published by Reagan Books, includes several stories about Gander's role during that and subsequent days. A radio play, The Day the Planes Came, by Caroline and David Stafford, dealing with the effect on Gander of the September 11 passengers was first broadcast in June 2008 on BBC Radio 4 and was repeated in October 2009. A TV movie, Diverted, was made in 2009. In February 2010, NBC aired a report by Tom Brokaw on Gander's role in the displacement of hundreds of planes on 9/11 during coverage of the Olympic Games in Vancouver. A musical by Irene Sankoff and David Hein, Come from Away, which retells stories of the people who were diverted to Gander and the people of the town who had helped out was mounted on Broadway in 2017. The town was also profiled in Moze Mossanen's 2018 documentary film You Are Here. 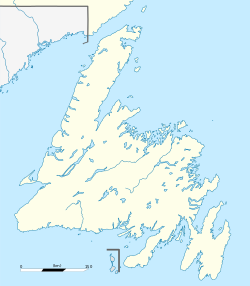 Gander is located 210 kilometres (130 mi) northwest of the provincial capital of St. John's, and about 970 kilometres (600 mi) northeast of Boston. According to Statistics Canada 2016 census, the current population of the town of Gander is 11,688, a 5.7% increase from 2011. There are a total of 4,887 private dwellings and the town's total area is 104.25 km2 (40.25 sq mi), with a population density of 112.0/km2 (290/sq mi). As of the 2006 census, the population of Gander was found to be 97.4% white with all visible minorities totaling 0.9% of the population and the aboriginal population totaling 1.7%. Gander has a cool to cold humid continental climate (Köppen climate classification (Dfb). It combines moderately warm and rainy summers with cold and very snowy winters. Due to the maritime influence from the Atlantic Ocean, seasonal changes are slightly less pronounced than in Canada's interior, but still substantial given its near-coastal position. Gander offers all the conveniences of a major centre. The newest development is a continually-expanding business park with big box stores such as Walmart and Kent Building Supplies. There are two malls: the Gander Mall, with stores such as Canadian Tire, SportChek, Dollarama, Claire's, Pseudio, Eclipse, and Nan's Pantry, and the Fraser Mall, with a Foodland (Sobey's) and various government offices. Town Square at the intersection of Elizabeth Drive and Airport Boulevard has several local businesses, including Riff's, and a Co-op grocery store. All five major Canadian banks have branches in Gander. TD Canada Trust and RBC Royal Bank are located in Town Square, CIBC in the Fraser Mall, as well as Bank of Montreal and Scotiabank on Airport Boulevard and Roe Avenue, respectively. There are two credit unions: Newfoundland and Labrador Credit Union and Hamilton Sound Credit Union, both on Roe Avenue. Medical services are provided by the James Paton Memorial Health Centre, on the Trans-Canada Highway. The hospital opened in May 1964 and has undergone many changes since then, making it a prominent hospital in the central region. The hospital has a rated beds capacity of 92. Telephone services are provided by Bell Aliant, formerly NewTel Communications. Bell Aliant also provides DSL high-speed internet service and FibreOp high-speed internet. Rogers Communications is the cable TV and cable internet provider for the town. Cellular phone service is also available through Telus, its subsidiary Koodo, and Bell's Virgin Mobile. The Gander Public Library is located at 6 Bell Place as of 1987. In 2013, Come from Away, a musical by Irene Sankoff and David Hein based on the events in Gander on and after September 11 (starring Chad Kimball and Jenn Colella) was first performed at Sheridan College in Oakville, Ontario, following a workshop there the previous year. It became a co-production of the La Jolla Playhouse and the Seattle Repertory Theatre, and opened in San Diego on May 29, 2015. The show saw a production in Washington, DC, at Ford's Theatre, from September to October 2016, then, prior to opening in Toronto, staged a pair of shows in Gander. It opened at Toronto's Royal Alexandra Theatre, running from November 2016 to January 2017, where it set a ticket sales record for the 109-year-old venue. It opened in New York on Broadway at the Gerald Schoenfeld Theatre on March 12, 2017, and is scheduled to return to the Royal Alex in Toronto on February 13, 2018. In the year 2017, the musical play was nominated for 7 Tony Awards, alongside other musical award nominations, ultimately winning one for Best Direction of a Musical. In 1991, the International Astronomical Union's Working Group for Planetary System Nomenclature (IAU/WGPSN) officially named a crater on Mars after Gander. Gander Crater lies at latitude 31.5° south, longitude 265.9° west; its diameter is 38 kilometres. Cobbs Pond Rotary Park: a small park located on the northern edge of Gander. Amenities include: picnic area, washrooms, wharf, playground and a 3 km boardwalk trail. It is also the site of the town’s annual festival, The Festival of Flight, which occurs on the first Monday of August. The site recently reopened with renovations. Thomas Howe Demonstration Forest: an interpretive demonstration forest located 2 km east of Gander on the Trans-Canada Highway. Amenities include: three walking trails with interpretive panels, a picnic area, washrooms and snowshoe trails. Gander Heritage Trails: meander through the streets of old Airport sectors where Gander once existed, near Gander International Airport. Look for remnants of old building foundations, benches and interpretive panels. Newfoundland Trailway: the old Canadian National Railway that passed through Gander has been developed for walking, biking, snowmobiling and cross-country skiing. Some sections between Cobb’s Pond Rotary Park and the Old Town Site have been paved. The Airport Nordic Ski Club: located 3 km west of Gander, Newfoundland & Labrador on the Trans Canada Highway. The club has 16 km of trails groomed for both diagonal stride and skating by a Pisten Bully Groomer, and 5.5 km of dedicated snowshoe trails. Ski 4 km of lighted trails nightly from dusk until 10 PM (weather and snow conditions permitting). The club is a non-profit, volunteer-run organization, deeply rooted in the community of Gander and the surrounding area. The Club strives to maintain a fun, family-oriented environment, and the club organizes many activities and programs including family fun days, socials and fundraising events, Jack Rabbit ski program, and the Gander Invitational. In addition the club has hosted a number of provincial events including the KidsFest, Midget and High School Championships. Gander Heritage Memorial Park: located in central Gander on Airport Boulevard. It holds various monuments to aviators and soldiers from Gander and from elsewhere in Newfoundland, and the town describes it as being "envisaged as a place of quiet thought and contemplation". ^ "Town Council". Town of Gander. Retrieved June 10, 2018. ^ GmbH, TERRITORY Content to Results. "Lufthansa: Identification Codes: Tell me what your name is, … | Lufthansa magazin". Retrieved 2018-02-28. ^ "The Day the Planes Came, Afternoon Drama - BBC Radio 4". Retrieved 21 June 2016. ^ "9/11: Operation Yellow Ribbon (Gander, Newfoundland)". NBC Olympics. Retrieved 27 Jan 2019. ^ Paulson, Michael (March 15, 2017). "Justin Trudeau Brings Ivanka Trump to Broadway Show on Welcoming Outsiders". New York Times. Archived from the original on March 16, 2017. Retrieved March 17, 2017. ^ "TV review: You Are Here proves the enduring power of the Come From Away story". Now, September 11, 2018. ^ Freed, Kenneth. "Canadians Make It Easy to Defect: This Way Out to Freedom: Refueling Stop at Gander." Los Angeles Times. July 22, 1985. Retrieved on April 28, 2015. ^ Canada, Government of Canada, Statistics. "Statistics Canada: 2006 Community Profiles". Retrieved 21 June 2016. ^ "Calculation Information for 1981 to 2010 Canadian Normals Data". Environment Canada. Archived from the original on 2013-06-14. Retrieved 2013-07-09. ^ "Daily Data Report for May 2012". Environment Canada. Retrieved 2016-08-14. ^ Purcell, Carey. ″La Jolla's World Premiere of Rock Musical Come from Away, With Jenn Colella and Chad Kimball, Begins″. Playbill. May 28, 2015. Retrieved December 11, 2015. ^ "Come From Away". Internet Broaadway Database. Retrieved 17 March 2017. ^ "The 2017 Tony Awards - And the Nominees Are... Complete List! NATASHA, PIERRE & THE GREAT COMET OF 1812 and HELLO, DOLLY! Lead Pack". BroadwayWorld.com. May 2, 2017. Archived from the original on May 3, 2017. Retrieved May 2, 2017. ^ - Town of Gander, Nfld. ^ "Gander Schools Legacy Project: The Gander Heritage Memorial Park / Conceptual Sketch". Retrieved 21 June 2016. Gander - Encyclopedia of Newfoundland and Labrador, vol. 2, p. 468-471.